Yaaay, the 2012 Summer Olympic Games are only a few weeks away! Sorry to disappoint, but the focus of this blog post isn’t THOSE Olympics; it’s about Olympic distance triathlon. Up until this point my triathlon events have been limited to Sprint distance races and participation in relays for longer distance events. But, I was expanding my horizons with the inclusion of Loveland Lake to Lake , which would be my 1st Olympic distance triathlon on June 23rd. My training calendar had pretty much, from the beginning, been focused on the training volume required to support an Olympic distance race. However, I hadn’t yet taken the leap to make it “happen” from a competing in that distance perspective. Lake to Lake is a biennial qualifier to Olympic Nationals and generally more serious athletes compete in this challenging event. 2012, however, was not a qualifying year so the intensity of participants would likely be a little lower than typical. Traditionally, Lake2Lake is longer than most Olympic distance events with a 30 mile bike ride. However, 2012 has thus far been the year of serious and devastating forest fires in Colorado. The fire that began on June 9th near Ft Collins right before my 1st Sprint Triathlon of 2012 continued and the team organizing Lake to Lake were forced to reroute the bike course. In the end, the run also had to be modified to a 5.1 mile run versus a traditional 10K. Still all-in-all, the event would be challenging, especially since temperatures on the day of the race were expected to hit 103 degrees! I attended packet pick-up and pre-race information was collected on the evening before the race. Guys #1 and #2 joined me for a pre-race dinner in the town of Loveland. (Yes, I had pasta.) Having my fan club with me makes these events SO much more enjoyable, well at least for me! Thanks guys! 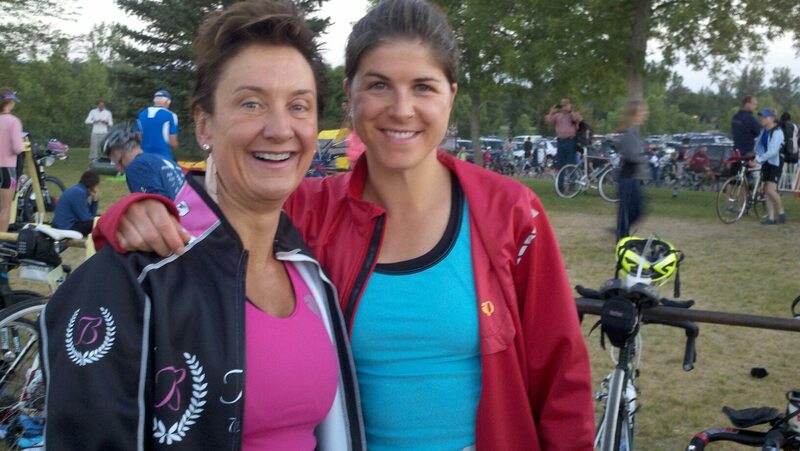 My friend Heather joined me at Lake to Lake and it was also her first Olympic tri. On race day, we arrived at the transition area when it opened at 5:00 a.m. and picked a prime position right by the bike start and bike finish area. We had our transition towels setup and per @CoachCary’s direction headed out on a pre-race warm up ride. But, when we returned our transition towels and race items were moved and another gal had placed her items where our bikes were, even though we’d put our wetsuits in the empty bike position which is typical for saying this spot is taken. Was she gracious when we informed her that she’d taken our place? NO way! Not only did she mess with our stuff and take our bike position but she was indigent in asserting that her stuff could and should fit into the designated spot and she then proceeded to give us condescending “educational” input on how transition areas worked. Wearing her Kona t-shirt and Kona visor…she strutted her Kona-esk self and Kona garnered expertise and patronizingly dressed us Olympic rookies down. Humph! This wasn’t Heather or my first TRI event, nor were we uninformed on the rules, guidelines and social norms of a triathlon. But, rather than waging war on “Betty” we decided to head out onto our pre-race run to warm up our legs and burn off some steam! When we returned “Betty” had taken it down a few notches as she had somehow climbed down off her lofty Kona queen tower and decided to interact with us rookies as fellow triathletes, thanks Betty! A warm up swim was next on the agenda and while short in duration it was sufficient in that I got wet, swam a couple of 100 meters and then proceeded back onto the beach waiting for my swim wave. Wave #3, the yellow cap group consisted of age groupers 50+ and Clydesdales. What?! Large horses swimming in triathlons? No! Clydesdales are men who weigh more than 200 lbs. As I headed toward the group of swimmers awaiting Wave #3, there were a couple of guys doning yellow swim caps walking next to me. They certainly weren’t 50+, so they must have been Clydesdales. I think the weight limit on Clydesdales is set too low, these guys were young, strong, fit…dare I say it, studs! OK, sorry, just couldn’t resist the play on words. The swim was a counter clock-wise single loop in Lake Loveland that made up 1,500 meters or one mile. Up until this point I hadn’t yet swum that far non-stop as an adult. Of course, I swam considerably more distance than that in my twice weekly Masters swimming sessions but there is always short wall time between sets. My time in the pool and open water training had me more than prepared and before long I was heading out of the water and running somewhere between ¼ and 1/3 of a mile from the water to the start of T1. Somehow, transitions always seem to take FOREVER and I’m generally pleasantly surprised when I review my T-times after the race results are posted. While I had no comparison to the typical Lake to Lake bike course. I was pleased with the bike route as it had reasonable hills and nice scenery that took us outside the city of Loveland. While the temperatures were starting to climb the breeze on the bike makes it harder to notice. However, once off the bike and heading into T2 then out onto the run I quickly noticed that the heat was going to be a bit of a challenge. While I’d done some running in the mid-day sun…I certainly wasn’t prepared for the serious blast of heat that was facing me. I seriously struggled on the run and included far more walking than what I’d anticipated or wanted. Feeling like I was overheating, I took two cups of water at each aid station…dumped one onto my head and drank the other. I was certainly happy to see the finish line, although not thrilled to hear the announcer say my name then note “doing the Penguin run”…ouch! And…given the heat wave I don’t think that my run/walk pace of 10:06 should garner a “Penguin” callout! But…I’m committed to being faster next time! This entry was posted in It's NOT the Destination...It's the Journey and tagged olympic distance triathlon, triathlon. Bookmark the permalink.